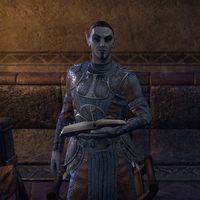 Bravosi Felder is a Dunmer who can be found in the Saint Olms Waistworks in Vivec City. He sits next to a small round table in the northwest corner of the central plaza and reads a book. He is a Telvanni wizard looking to study the new mushroom species in Nilthog's Hollow. If spoken to before his related quest, Bravosi asks you, "Do you know if a nix-ox hibernates? No, what am I saying, that won't fix anything." "You must be here about the job notice I posted. Wonderful! I really can't afford to lose more specimens." "It's simple, really. I need you to get rid of that horrid nix-ox so I can get back to my research. I also need you to collect as many mushroom samples as possible. The sooner the better. This whole affair has set my progress back at least two weeks!" What's so special about these mushrooms? "I have no idea! I'm starting from complete ignorance with this particular species. That's the beauty of discovery—the possibilities are endless! It's also precisely the reason I need so many specimens to continue my research. "Honestly, what am I not researching? The obvious alchemical ramifications of such a unique strain of fungi cannot be ignored, but there are so many possibilities. To give but one example, I've already found them to be an amazing addition to soup!" Can you tell me more about this nix-ox? "I usually find it best to make peace with the local fauna when doing field work, but this nix-ox has proved incorrigible. Not only does it plan to eat my mushrooms into extinction, it's also exceedingly malicious, hostile, and just plain unsanitary." "Any luck with that blasted nix-ox?" I took care of the nix-ox and have the mushroom samples. "Thank you, friend! You've done me, nay, the world, a huge favor today. I already know that the breakthroughs I'll make with these specimens will be talked about across the ages. And I'll of course make sure to credit you in my dissertation." "Thank you, my friend! It will be good to get back to studying this wonderful fungus." This page was last modified on 20 February 2019, at 00:48.